Ever wish you could write your own song? Guess what? You can compose your own music … with a little help from technology. 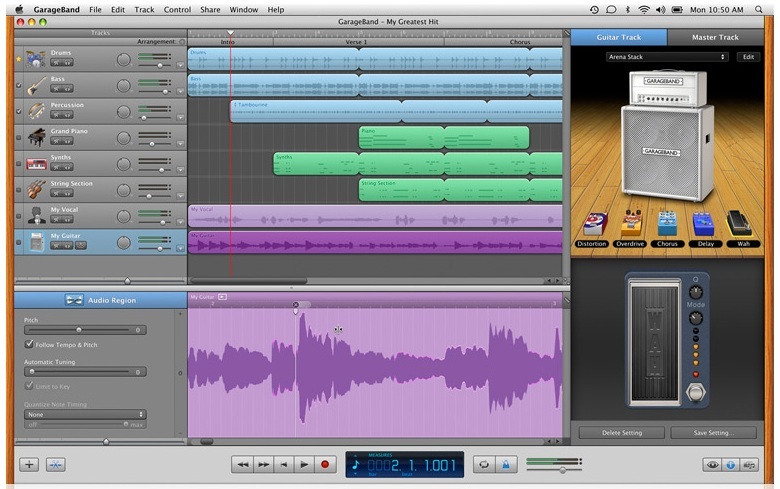 GarageBand is popular software that helps you create music fast. No musical skill is required, either. ** GarageBand is both easy to learn and fun to use. It works by letting you pick music loops, paint them across a grid, and make original music. Think of it like word processing with music. A music loop is a pre-recorded snippet of a musical performance that repeats. A single loop might be a drum beat, bass guitar riff, piano part, or something else. By selecting and arranging different musical loops, you create new songs. To get started GarageBand includes hundreds of loops in a variety of styles – rock, orchestral, hip-hop, techno, ethnic/world, electronica, ambient, and nearly everything in between. If you need to adjust the tempo and/or the musical key GarageBand automatically matches the loops to what you select. You can add vocals (and other instruments), too. Now it’s your turn. Studio 300 has dedicated equipment and spaces to create and record your own music. We’ll even help you get started. Studio 300 is scheduled to open in early spring of 2013. ** If you do have musical skills, GarageBand has powerful musical composition tools to take your music to the next level. Check out the features here. This entry was posted in DIY FYI and tagged audio, how-to, music. Bookmark the permalink.